The raw food movement is “mushrooming” as classes and events are “sprouting” up across the globe, “cultivating” a large number of raw-curious people wondering why any sane person would cease to cook their food. This article is meant to “plant a seed” of basic reasons why one might consider including a greater number of foods in their natural state of grace and in part two, why becoming vegan is the only option for healing our planet, whether we choose cooked or raw. Our food choices affect not just our own vessel, our food choices affect the vibration of the planet as a whole. Part One of this article will address our physical bodies and the benefits a plant based diet have to offer us. Part two will shed light on the cost to the planet and our higher selves when we choose to use animal products for our sustenance. How about a longer, healthier life? 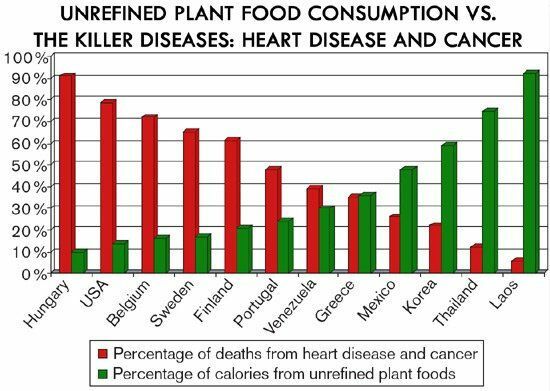 Clearly a plant based diet affords some protection against these two major killers. A great book on the subject is called The China Study, by T. Colin Campbell. Dr. Campbell report on the single largest nutritional study ever undertaken that reveals just how a high animal protein diet actually feeds and fosters cancer growth. When we simplify our diet to include only fruits, vegetables, nuts and seeds, we embrace the most nutrient dense food on the planet! Yes, it’s true…. Vegetables have the highest percentage of minerals per calorie of any class of foods. Fruits have the highest percent of vitamins per calorie of any class of foods. Raw, unadulterated foods retain ALL of their Vitamins, Minerals, Phytonutrients and Enzymes. Enzymes are there so that we can utilize all these wonderful nutrients and health is pretty much covered! Enzymes are necessary for every action and reaction that occurs in our body. Blink! you had to have enzymes to do it. Breathe! Enzymes have it covered. Talk, move, think, dance, you guessed it! You can thank enzymes for doing their part. Every vitamin or mineral must have an enzyme tied to it to be assimilated. Every living thing contains not only the enzymes to continue and enhance life, but also to break it down once life is no longer present. “And unto dust you shall return” …. We return with the help of enzymes. Sadly these superheros have a weakness. Heat. Enzymes are “denatured” or destroyed when food is heated above about 118 degrees F. and there is not a lot of wiggle room here. Enzymes are rather delicate and do their best work at about body temperature. All cooked and processed foods are devoid of any enzymes. Our body has to make up for this lack and it does, by producing digestive enzymes from the pancreas and liver. Digestive enzymes are made up of metabolic enzymes put together. It takes 10 metabolic enzymes to create just one digestive enzyme, so you body has to work overtime to digest cooked food. For that reason, as we age, more and more of our energy reserves go toward digesting the food we eat instead of toward dancing or biking or hiking or sitting in meditation or chanting or shoveling snow. Increased vitality is a great reason to choose raw. As we age, up to 70% of our energy is used to digest out food. Ingesting whole foods allows for calorie reduction because of the nutrient density. Less really is more. Hydration is another key component in health. Check out the book Your Body’s Many Cries for Water by F. Batmanghelidj. The body can last up to six weeks without food, but only about a week without water. Water carries nutrients and oxygen to all cells in the body and helps convert food into energy. Water protects and cushions vital organs and lubricates joints. The human body is about 66% water, muscles are 70-75% water, our lungs are 90% water and our brain is 95% water. Fruits & Vegetables are easy hydrators as they are almost 95% water! Weight Loss (or Gain) is a pleasant side effect of choosing this path because as our body is flooded with nutrients, it reawakens it’s internal wisdom and normalizes weight. If you need to gain, you will gain, if you need to shed pounds, off they go. The “Glow” Fritz-Albert Popp is a biophysicist who confirmed the emission of biophotons (“ultraweak” photon emissions from living tissues). Popp showed that wild grown food had twice the amount of biophotons than organic and organic had five times the biophoton emmision that commercially grown food had. Cooked food had ZERO. This is measurable. The healthier the person, the greater the biophoton emissions. The average person eating junk food had about 1000 units of Biophoton emissions. The average baby about 43,000 the average plant-based person 43,000, the average person eating live foods about 83,000. One person who ate mainly wild-crafted herbs and who fasted regularly measured 114,000! We are light beings, when we ingest food with light, we emit more light. This is huge! We eat the plants and we incorporate their light and then we emit it! Raw foodies appear to have a “glow because the are really “glowing”. They are actually emitting more light! Wow. It’s an easy jump to what that might do for meditation and the health and connection of our spirit bodies. Raw food supports us as Light Beings! Ahimsa. In the next article, I will touch on the many reasons we must choose a vegan diet (raw is optional here) in order to reduce violence and increase vibration. Mother Earth is crying for our help. The numbers are daunting. Stay tuned.